Coverage: Live on BBC TV, Radio 5 live sports extra, Red Button and Connected TVs from 09:00 BST, Radio 5 live from 10:00 and tablets, mobiles and app from 06:30. Luke Donald is warning that St Andrews will turn into a different golf course if the weather forecast proves correct. "The front nine is playing as easy as it can get here," said Donald after firing a four-under-par 68 at the Open. "But it was a lot tougher coming home. "The forecast is for the wind to get up. I've heard rumours of gusts of maybe up to 40mph on their way. "If that's the case, it's a different golf course. The wind is a pretty big equaliser." The former world number one made a convincing start to the 144th Open Championship as he stretched his current run of good form. Now playing in his 15th Open, Luke Donald has twice tied for fifth - at Turnberry in 2009 and again at Royal Lytham in 2012. In his three St Andrews Opens, he has markedly improved his position on his next visit. In 2000, he missed the cut. In 2005, he shot a four round-total of 283 to finish tied for 52nd. In 2010, he bettered that by five shots to finish tied for 11th. 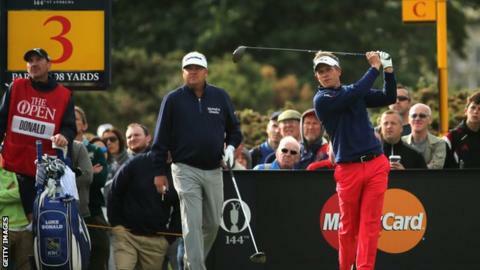 Having slipped to 64th in the world rankings after a lean run over the last two years, there have been encouraging recent signs that the 37-year-old Hemel Hempstead-born former Buckinghamshire amateur was getting back to his best form. In fact, having enjoyed two successive top 10 finishes at the Travelers Championship in the States, before also tieing for seventh last week at the Scottish Open, Donald's bogey-free card stretched his current run of sub-70 rounds to nine. He reached the turn in 32 with four birdies, before parring his way round the more difficult back nine, including an escape from the infamous road hole bunker at 17. "That felt like I'd saved two shots," Donald told BBC Sport. "I felt I had just had a good enough lie to take it on. "At St Andrews, you usually get one nine that's very scorable and one nine that's tough, which is generally the back nine here. "But, on the front nine this morning, you were playing a lot of short irons into these holes and, if you've got guys with wedges in their hands and soft greens, you're going to make some birdies, no matter how tough the pin positions are."